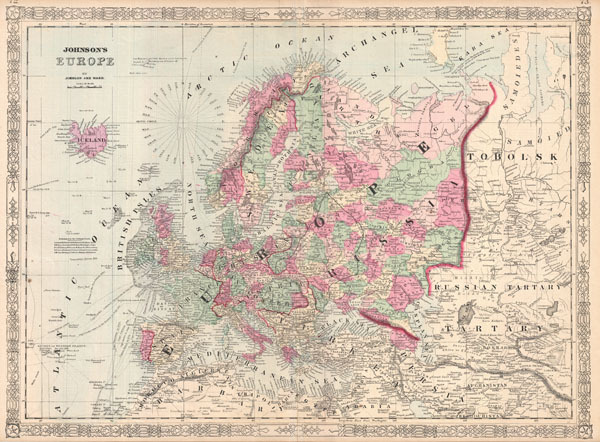 A. J. Johnson's beautifully hand colored 1864 map of Europe. This map shows cities, topographical features, railways, ferries and roads with color coding at the regional level. The routes of various explorers, including Cook, Byron, Carteret, and others, are shown. In contrast to most Johnson maps, the sea is here rendered in a pale blue. This is the last edition of this map, which harkens back to Johnson's 1860 Europe, to be released before Johnson re-engraved his continental map places in the later part of 1864. Alvin Jewett Johnson (September 23, 1827 - April 22, 1884) was a prolific American map publisher active from 1856 to the mid-1880s. Johnson was born into a poor family in Wallingford, Vermont where he received only a based public education. He is known to have worked as school teacher for several years before moving to Richmond, Virginia. Johnson got his first taste of the map business and a salesman and book canvasser for J. H. Colton and company. The earliest Johnson maps were published with D. Griffing Johnson (no clear relation) and date to the mid-1850s, however it was not until 1860 that the Johnson firm published its first significant work, the Johnson's New Illustrated (Steel Plate) Family Atlas. The publication of the Family Atlas followed a somewhat mysterious 1859 deal with the well-established but financially strapped J. H. Colton cartographic publishing firm. Although map historian Water Ristow speculates that Colton sold his copyrights to Johnson and his business partner, another Vermonter named Ross C. Browning (1832 - 1899), a more likely theory is that Johnson and Browning financially supported the Colton firm in exchange for the right to use Colton's existing copyrighted map plates. Regardless of which scenario actually occurred it is indisputable that the first Johnson atlas maps were mostly reissues of earlier Colton maps. Early on Johnson described his firm as the "Successors to J. H. Colton and Company". Johnson's business strategy involved transferring the original Colton steel plate engravings to cheaper lithographic stones, allowing his firm to produce more maps at a lower price point. In 1861, following the outbreak of the American Civil War the Johnson and Browning firm moved their office from Richmond, Virginia to New York City. Johnson and Browning published two editions of the Johnson Atlas in 1860 and 1861. Sometime in 1861 Browning's portion of the firm was purchased by Benjamin P. Ward, whose name subsequently replaced Browning's on the imprint. The 1863 issue of the Family Atlas was one of the most unusual, it being a compilation of older Johnson and Browning maps, updated 1862 Johnson and Ward map issues, and newer 1863 maps with a revised border design. The 1864 issue of the Family Atlas is the first true Johnson and Ward atlas. Johnson published one more edition of the atlas in partnership with Ward in 1865, after which Johnson seems to have bought out Ward's share the firm. The next issue of the Atlas, 1866, is the first purely "Johnson" atlas with all new map plates, updated imprints, and copyrights. The Family Atlas went through roughly 27 years of publication, from 1860 to 1887, outliving Johnson himself who died in 1884. Johnson maps from the Family Atlas are notable for their unique borders, of which there are four different designs, the "strapwork border" from 1860 to 1863, the "fretwork border" from 1863 to 1869 and the "spirograph border" in 1870 – 1882, and a more elaborate version of the same from 1880-1887. In addition to the Family Atlas Johnson issued numerous wall maps, pocket maps, and in the 1880s the Cyclopedia. Johnson maps are known for their size, accuracy, detail, and stunning, vivid hand coloring. Johnson maps, purely American in their style and execution, chronicle some of the most important and periods in American history including the Civil War, the Westward Expansion, and the Indian Wars. Today Johnson's maps, especially those of the American west, are highly sought after by map collectors and historians. Johnson, A. J., Johnson's New Illustrated (Steel Plate) Family Atlas of The World with Physical Geography, and with Descriptions Geographical, Statistical, and Historic including The Latest Federal Census, A Geographical Index, and a Chronological History of the Civil War in America, (first Johnson and Ward), 1864. Very good condition. Original centerfold. Text on verso. Even overall toning. A couple of minor edge repairs and verso reinforcements. Rumsey 2905.039 (1860 edition). Phillips (Atlases) 6140.